Ayurveda, the science of life, represents the awareness in living. Considered by many the most ancient medicine system in the world, its roots can be seen still in our days. 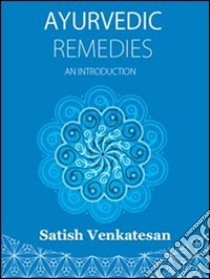 As certified practitioner in Ayurveda Medecine, Satish ?Venkatesan presents in this book a detailed overview of remedies meant to improve and enhance the body functions through prevention. By introducing the theories at the basis of this discipline, he explains the importance of maintaining the balance among the different energies flowing through the body during our daily life.